This 14K White Gold elegant ring boasts a stunning round brilliant TransGems Moissanite center stone surrounded by a host of sparkling melee moissanite accent stones. VG Cutting accent gems arrounding the center design for a sparkle that will take her breath away. A glittering, gem-lined split shank completes this enchanting design. Ring size is available from US#4 to US#12. Please confirm the ring size & metal color when you placing the order. Total 3.15CT,Center stones 1.5 ct (7.5mm) D-E -F moissanite Center Stone as beautiful and lasting as best quality diamonds!!! 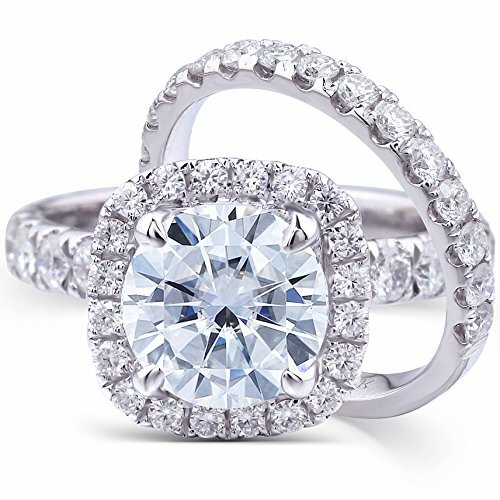 Moissanite is highest Craftsmanship Level and Jewelry Finish. Shine as same as the diamond, hardness almost on the same level. Most brilliant gem on earth. Manufactured by Transgems. (Customization is acceptable with adorable price),Size #4--#12（leave a message of your size）. Lifetime Warranty and Certificate of Authenticity included,shipping in DHL. If you have any questions about this product by TransGems, contact us by completing and submitting the form below. If you are looking for a specif part number, please include it with your message.